Miles Morales is a teenage boy who has always liked Spider-Man. His policeman father, though, could care less about the city’s popular superhero. That’s because Spider-Man is a rogue, morally ambiguous masked man who creates more problems than he solves -- and then leaves everyone else to clean it up. At least, that’s how Mr. Morales sees it. So when Miles gets bit by a radioactive spider and begins climbing on ceilings and walls, he’s not only confused -- “how could there be two Spider-Men?” -- he’s also uncertain what to tell his father. Things get even weirder when Miles bumps into several other people (including a woman) who have spider-like powers. What’s going on? The film Spider-Man: Into the Spider-Verse (PG) opens this weekend, telling the story of a boy who is searching for his identity in life when he becomes the superhero he’s always loved. The film also follows the villain Kingpin, who is creating a machine that allows him to enter other universes. That’s where these other “spider people” are originating. It stars Shameik Moore (Incredible Crew) as Miles, Hailee Steinfeld (Pitch Perfect 2) as Gwen/Spider-Woman, Kimiko Glenn (DuckTales) as Peni Parker, Nicolas Cage (National Treasure) as Spider-Man Noir, and comedian John Mulaney as Spider-Ham. It feels like a comic book come to life. With frequent speech balloons and a few quirky scenes, it’s a little like the old BatmanTV series -- but a hundred times better. The plot follows six different “Spider People” from different universes, including Spider-Woman, an Asian anime Spider girl named Penni Parker, a black-and-white 1933 version named Spider-Man Noir, and a pig in a suit named Spider-Ham. Their goal is to escape 2018 America and get back to their respective universes through the multiverse portal that Kingpin is creating. If they don’t do that soon, they will die. Meanwhile, Kingpin is trying to bring his deceased family back to life. The film is a mixture of science fiction and comedy, with a superhero plot and a few serious themes tossed in. It’s fun. 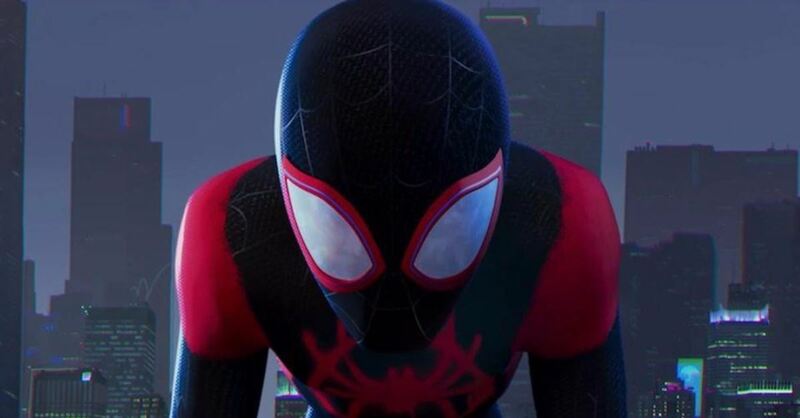 Spider-Man: Into the Spider-Verse isn’t as violent as live-action Marvel and DC films, but it's noted as tame as the superhero-themed Incredibles films, either. We see two major characters killed; one is crushed to death and the other shot with a gun. There is frequent punching, kicking and fighting. And, like every superhero film, it ends with a giant battle royal. It also has one or two disturbing characters that may give children nightmares. One of these -- Prowler -- is a masked man with talons who only does his bad deeds at night. (Of course!) He gave me the creeps. Parents who are troubled by the violence and themes in other superhero movies need to skip this one. The film also contains one coarse word (h-ll), which seems out of place. A kid-centric animated film with a curse word? That’s about as bad as “candy cigarettes.” They just don’t belong together. Miles’ parents love him unconditionally and express it often. “I love you, Miles,” his policeman father tells him while dropping him off at school. When Miles refuses to respond, his father grabs the police car microphone and gets the attention of the schoolyard, demanding that Miles say those three magic words -- “I love you” -- in front of his friends. Point made. Later, when the father senses that he’s putting too much pressure on Miles to succeed, he pulls back: “Whatever you choose to do … you’ll be great.” This family theme extends to the villains. Kingpin is trying to bring back his wife and child, who were killed in a car wreck. And another villain -- Prowler -- has strong feelings for his own family. Too many Hollywood movies send us the wrong messages about family. This one gets it right. It also has great messages about self-sacrifice, courage and humility. The film is just shy of two hours, which is a long time to sit if you’re an antsy, 9-year-old slurping on soda. It has a mid-credit scene and a post-credit scene. The mid-credit one is a brief, written tribute to Marvel icon Stan Lee, who died in November and has a cameo in the movie. The post-credit scene is comical but not essential to the plot. If the kids need to go to the restroom, it’s not worth the wait. Entertainment rating: 3 out of 5 stars. Family-friendly rating: 3.5 out of 5 stars.